Durable And Secure Storage Device. Holds Up To Four Pairs Of Winter Skis. Stuff Points: Earn 70 points when you buy this stuff. Store and protect your downhill skis when not in use. This sturdy rack holds up to four sets to keep them off the ground, neatly organized, and out of the way. You'll keep your garage clean and protect your skis at the same time. Durable materials allow for a lifetime warranty, and the clever design allows for installation in just minutes. Don't just toss them in a corner, and stop taking up a whole closet for off season storage. Get this rack, and install in a garage, basement or shed to keep your skis in perfect condition while improving organization, and freeing up more space. This sturdy rack features all steel construction, and can hold up to 200 pounds so it's easily strong enough to support your gear, and durable enough to last through many seasons. 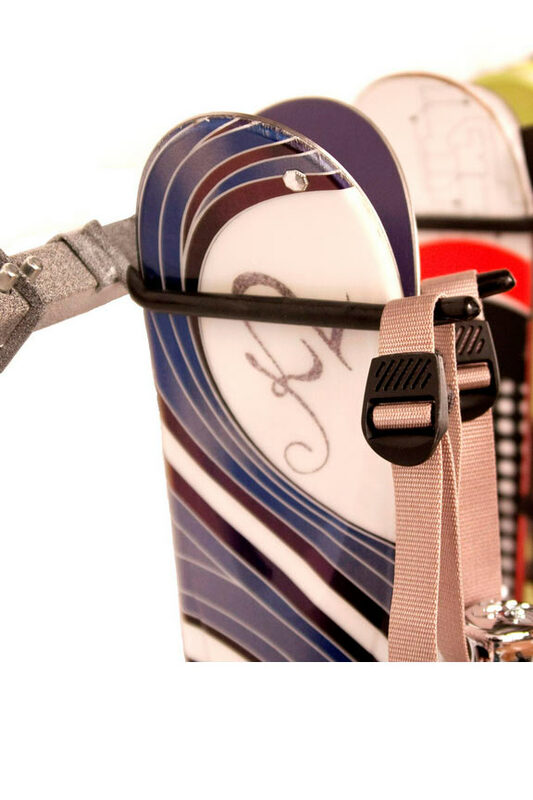 The simple and effective design employs vinyl coated hooks that will gently grab and secure each set of skis, while leaving room at the end for you to hang the poles as well. You can store up to four sets on this steel storage rack, but even when used for less, it won't seem too bulky or unreasonable. Plus, the extra hooks can be used to hold other complimentary equipment if you have space left over. In this way, it's perfect for a family of skiers, but can be equally useful for one or two people as well. All hardware necessary for installation is included with your purchase. 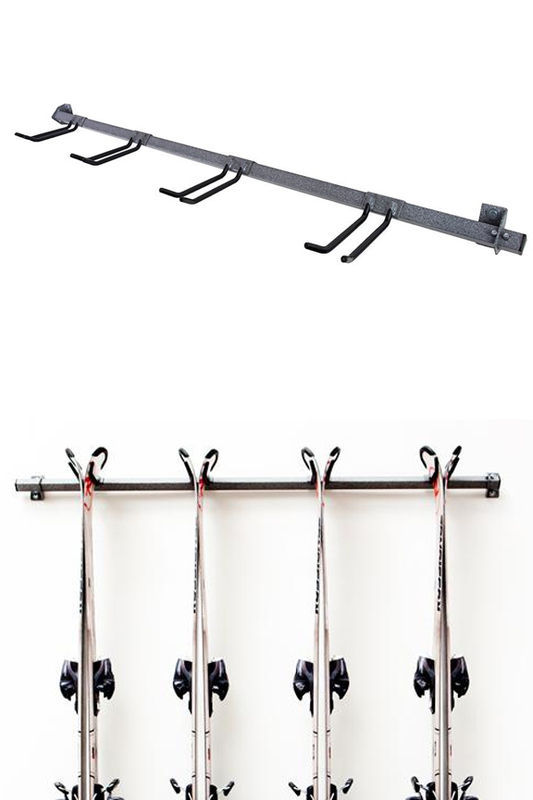 The 4 Ski Storage Rack is perfect for the skier who has multiple pairs of skis in their quiver, a couple who wants their boots stored in the garage, or for the small family. You will be able to get your skis out of the corner and up off the ground. The industrial construction of this ski storage rack will easily handle the weight of the fattest of skis. The rubber coating on the hooks will keep the top sheets of your skis looking great. The rack is also backed by a lifetime warranty. Uses Hang and store skis and poles when not in use. Get the whole family's skis up off the ground to reduce clutter and prevent damage. Compatibility Hang up to 4 sets of skis and their poles. Works with virtually any type of winter ski. Capacity Hang up to 200 lbs. Finish Powder Coated with a granite-like finish. Hooks Included Comes with four 6" narrow hooks. Hardware Included Yes - Comes with all hardware needed for installation. Assembly Required Yes - Simple assembly required. May take up to 15 minutes to mount. Give your skis a home, and make them easier to store when your not using them. This sturdy rack sorts and elevates everyone's skis in order to make them last longer, reduce clutter, and make them easier to find. Order Yours Today! A Wall Mount Soccer Ball Holder. Organize, Store or Display. A Basketball Holder And Storage Device. Mount To Any Wall! Large, Sturdy Storage Device. Holds Up To Six Bags Of Clubs. Durable And Secure Storage Device. Holds Up To Six Pairs Of Winter Skis. Versatile Storage Rack For All Of Your Sporting Goods. Store And Organize The Easy Way. A Combination Storage Unit That Holds 3 Sets Of Skis And 4 Snowboards. Durable Rack For Storing And Organizing Up To 6 Snowboards. Industrial Strength Steel For Commercial Applications Or Use At Home, In Garages, Sheds, Shops and Barns.